St. Juvin Post members (from left) Adjutant Keith Roseland, Quartermaster Jim Richards, Representative Welter, Life Member Ron Hibler and St. Juvin Sr.Vice- Commander Irv Dewald Present Welter with the Post’s award for “distinguished and meritorious service” to veterans. 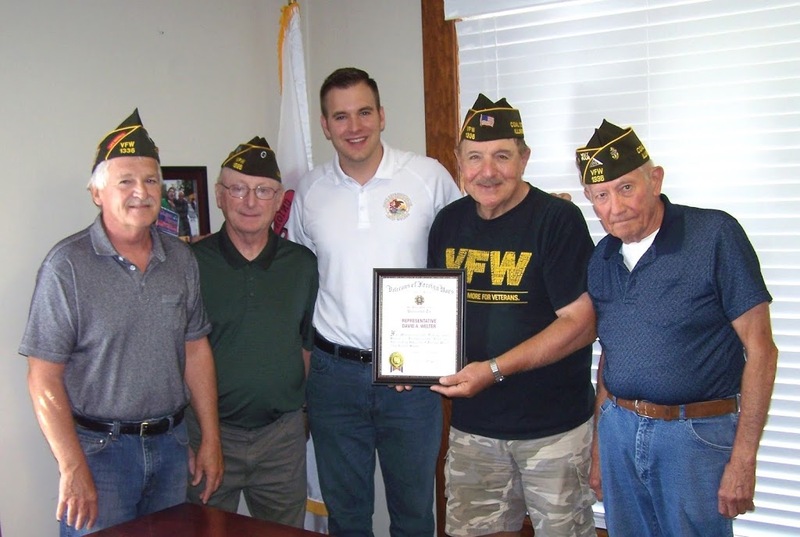 Coal City’s St. Juvin Post 1336 VFW members presented Illinois State Representative David A. Welter, R-Morris, with their Post’s award for meritorious and distinguished service in furthering the aims and ideals of the Veterans of Foreign Wars at his Morris office on August 9th . St. Juvin Post presented this award to Welter for his support of all veterans and his support of St. Juvin Post at their recent Bingo fundraiser held on July 15th in Coal City.